The first link in a food chain is always a primary producer (i.e. algae, plants, various types of bacteria). This is because all other living things—consumers—are incapable of synthesizing organic substances from inorganic ones. Primary producers rely on inorganic sources of energy (sometimes chemical, but usually from light). Using this energy, they take substances such as ammonium and phosphate and convert it into biomass—biomass that may be consumed by herbivores and subsequently passed down the chain. Consumers generate metabolic wastes such as carbon dioxide and ammonium, which are readily taken up and recycled by the growing producers. Phytoplankton are basically tiny (generally unicellular), plant-like organisms. Most of the phytoplankton are from a large group of distantly related primary producers referred to as the algae. Though they do not share similar lineages, they are strikingly similar in form and habit; all are miniscule, photosynthetic organisms that live suspended in the water column. It is believed that they carry out most the planet’s primary production. Indeed, life on Earth wouldn’t be even remotely the same without them. And almost as importantly? They can improve the health of a marine aquarium system. The world’s oceans are crisscrossed by steady surface water currents. When they collide into landforms or into each other, some are driven to the depths. This action pushes deep waters up to the surface in a process called upwelling. These waters from the deep are laden with nutrients. Why? Because when anything dies in the water column, it sinks to the sea bottom. There, nutrients accumulate, since mixing between different ocean water layers is minimal. Minimal, except, in areas of strong upwelling! This critical ecological process is known as the biological pump. Other than dissolved nutrients, there is a lot of something else in the shallows of an upwelling zone: light! This means that photosynthetic plankton may thrive there. 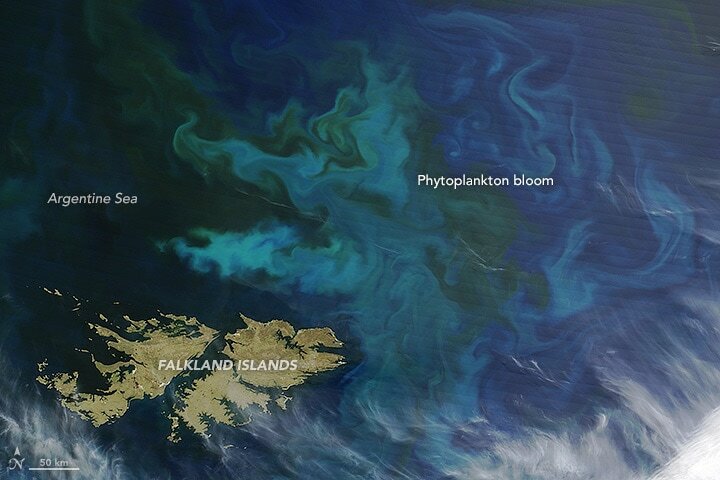 These areas sometimes produce vast pastures of phytoplankton that may be observed from space. Massive blooms produce a heady amount of microalgae that spread out into the rest of The Ocean. That last part is critical—this is a major source of the phytoplankton on coral reefs which are notoriously nutrient-poor environments. Plankton simply washes in from the open ocean via the tides. Though phytoplankton species claim only a modest portion of primary production on the reef itself, they are nevertheless important in that they serve as a major source of vital nutriments such as omega fatty acids. Various products are available for home aquarists that wish to use phytoplankton. These might supplement the diets of disparate invertebrates including certain corals, clams, tube worms, sponges, and other such fine-particle filter-feeders. They also promote large populations of pods, which depend upon phytoplankton during certain (especially larval) life stages. These may be live or preserved products. The idea with all of them is to add just a little at a time, but frequently, rather than adding a whole lot on rare occasions. Some aquarists even feed continuously by way of dosing equipment. It’s just fine, though, to pour in a small amount once each evening. Think of it as replenishing with the tidal cycle. You only need to use enough to impart a barely discernible greenish or yellowish tint to the water (this will go away very quickly as the phytoplankton is consumed). What makes a good phytoplankton-based aquarium feed? It is a live (rather than dead and preserved) product. It contains a wide range of cell sizes. Live products are vastly superior for a number of reasons. First, a product made up of intact, living cells is a lot cleaner as a feed than those that are made of dead stuff. So, it’s much harder to pollute your tank from overdosing when using live phyto. In fact, live and growing phyto actually removes waste products from the aquarium water! Also, it stays up in the water column where filter-feeders can get it, unlike some dead or artificial formulas that quickly settle out over the tank bottom. Mixed-species products are preferable. Why? Because no single species of phyto is perfect. The right blend of species, however, can result in an ideal nutritional profile. It also provides a wider range of cell sizes; this is great because it makes sure that all different types of filter-feeders get their share. Is phyto easy to use? It can be, and it should be. The best products come in a resealable container that is suited for multiple use. Some even come in a bottle with a dosing neck for easy measurement. Your dosing routine can be really simple by setting up a subscription for regular, automatic shipments of live phyto by mail. As many successful reef aquarium hobbyists will attest, adding phytoplankton is well worth the small investment in effort and time! The phytoplankton I have a crush on which I learned about from AlgaeBarn is OceanMagik. Thank you, Greg, for turning me onto this product that has made my tank diamond clear and kept my corals vibrant and absolutely gorgeous. When setting up my RedSea 170 I struggled with excess slime and stringy brown algae. OceanMagik has helped make my tank a spectacular showpiece. Thanks Greg!! Get your OceanMagik and witness the transformation for yourself! So if my bottle of ocean magik is outdated by a few weeks but does not smell like sulfur or anything foul, can my tank still benefit? I’ve used phyto in the past. I noticed results quickly. I’ve regretted the day I stopped using it. Need to get back in it since I’ve got more corals now. I’ve used phyto in he past when I had a few corals. Now that I have more, I need to start using it more. Noticed a difference with the few corals I had. Phyto is awosme. Phytoplankton is so important to our reef tank’s and I don’t think most people realize that. I try to spread the message. Great job Algaebarn!